The RAV4 EV was an all-electric version of the popular RAV4 SUV produced by Toyota. It was leased from 1997 to 2003, and at the lessees request, many units were sold after the vehicle was discontinued. As of 2010 there are 800 units still in use. In July 2010 Toyota announced that is working together with Tesla Motors to develop a second generation RAV4 EV, and the companies expect the vehicle to be mass produced by 2012. 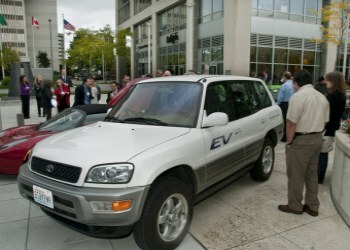 The first fleet version of the RAV4 EV became available on a limited basis in 1997. In 2001 it was possible for businesses, cities or utilities to lease one or two of these cars. Toyota then actually sold or leased 328 RAV4 EVs to the general public in 2003, at which time the program was terminated despite waiting lists of prospective customers. The RAV4 EV closely resembles the regular internal combustion engine version - without a tailpipe - and has a governed top speed of 78 mph with a range of 100 to 120 miles ). The 95 amp-hour NiMH battery pack has a capacity of 27 kWh, charges inductively and has proven to be surprisingly durable. 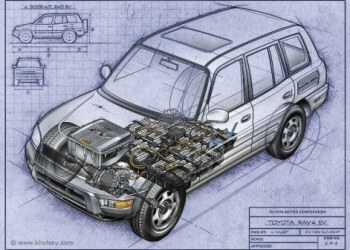 Some RAV4 EVs have achieved over 150,000 miles on the original battery pack. It was also one of the few vehicles with a single speed automatic transmission at that time. Besides the batteries, controller and motor, the remaining systems in the RAV4 EV are comparable to the gas-powered RAV4, such as power brakes, power steering, air conditioning, tire wear and suspension components except for the power sources involved. The power brakes use an electric pump to provide vacuum instead of deriving vacuum from the engine manifold while the power steering and air conditioning systems use electric motors instead of mechanical energy delivered by fan belts. The passenger compartment heater is electrical.